Transparent data encryption (TDE) helps protect Azure SQL Database, Azure SQL Managed Instance, and Azure Data Warehouse against the threat of malicious activity. It performs real-time encryption and decryption of the database, associated backups, and transaction log files at rest without requiring changes to the application. By default, TDE is enabled for all newly deployed Azure SQL databases. TDE cannot be used to encrypt the logical master database in SQL Database. The master database contains objects that are needed to perform the TDE operations on the user databases. TDE needs to be manually enabled for Azure SQL Managed Instance, older databases of Azure SQL Database, or Azure SQL Data Warehouse. Transparent data encryption encrypts the storage of an entire database by using a symmetric key called the database encryption key. This database encryption key is protected by the transparent data encryption protector. The protector is either a service-managed certificate (service-managed transparent data encryption) or an asymmetric key stored in Azure Key Vault (Bring Your Own Key). You set the transparent data encryption protector at the server level for Azure SQL Database and Data Warehouse, and instance level for Azure SQL Managed Instance. The term server refers both to server and instance throughout this document, unless stated differently. On database startup, the encrypted database encryption key is decrypted and then used for decryption and re-encryption of the database files in the SQL Server Database Engine process. Transparent data encryption performs real-time I/O encryption and decryption of the data at the page level. Each page is decrypted when it's read into memory and then encrypted before being written to disk. For a general description of transparent data encryption, see Transparent data encryption. SQL Server running on an Azure virtual machine also can use an asymmetric key from Key Vault. The configuration steps are different from using an asymmetric key in SQL Database and SQL Managed Instance. For more information, see Extensible key management by using Azure Key Vault (SQL Server). In Azure, the default setting for transparent data encryption is that the database encryption key is protected by a built-in server certificate. The built-in server certificate is unique for each server. If a database is in a geo-replication relationship, both the primary and geo-secondary database are protected by the primary database's parent server key. If two databases are connected to the same server, they also share the same built-in certificate. Microsoft automatically rotates these certificates in compliance with the internal security policy and the root key is protected by a Microsoft internal secret store. Microsoft also seamlessly moves and manages the keys as needed for geo-replication and restores. All newly created SQL databases are encrypted by default by using service-managed transparent data encryption. Azure SQL Managed Instance databases, existing SQL databases created before May 2017 and SQL databases created through restore, geo-replication, and database copy are not encrypted by default. TDE with customer-managed keys in Azure Key Vault allows to encrypt the Database Encryption Key (DEK) with a customer-managed asymmetric key called TDE Protector. This is also generally referred to as Bring Your Own Key (BYOK) support for Transparent Data Encryption. In the BYOK scenario, the TDE Protector is stored in a customer-owned and managed Azure Key Vault, Azure’s cloud-based external key management system. The TDE Protector can be generated by the key vault or transferred to the key vault from an on premises HSM device. The TDE DEK, which is stored on the boot page of a database, is encrypted and decrypted by the TDE Protector, which is stored in Azure Key Vault and never leaves the key vault. SQL Database needs to be granted permissions to the customer-owned key vault to decrypt and encrypt the DEK. If permissions of the logical SQL server to the key vault are revoked, a database will be inaccessible and all data is encrypted. For Azure SQL Database, the TDE protector is set at the logical SQL server level and is inherited by all databases associated with that server. For Azure SQL Managed Instance (BYOK feature in preview), the TDE protector is set at the instance level and it is inherited by all encrypted databases on that instance. The term server refers both to server and instance throughout this document, unless stated differently. With TDE with Azure Key Vault integration, users can control key management tasks including key rotations, key vault permissions, key backups, and enable auditing/reporting on all TDE protectors using Azure Key Vault functionality. Key Vault provides central key management, leverages tightly monitored hardware security modules (HSMs), and enables separation of duties between management of keys and data to help meet compliance with security policies. 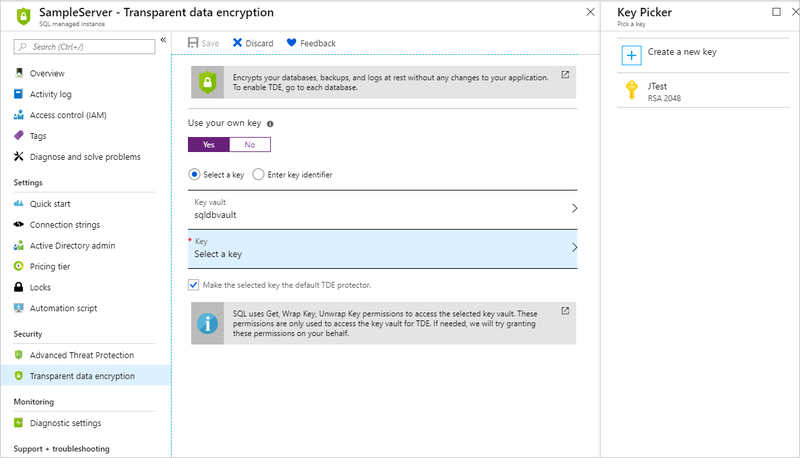 To learn more about transparent data encryption with Azure Key Vault integration (Bring Your Own Key support) for Azure SQL Database, SQL Managed Instance (BYOK feature in preview), and Data Warehouse, see Transparent data encryption with Azure Key Vault integration. To start using transparent data encryption with Azure Key Vault integration (Bring Your Own Key support), see the how-to guide Turn on transparent data encryption by using your own key from Key Vault by using PowerShell. Taking manual COPY-ONLY backup of a database encrypted by service-managed TDE is not allowed in Azure SQL Managed Instance, since certificate used for encryption is not accessible. Use point-in-time-restore feature to move this type of database to another Managed Instance. When you export a transparent data encryption-protected database, the exported content of the database isn't encrypted. This exported content is stored in un-encrypted BACPAC files. Be sure to protect the BACPAC files appropriately and enable transparent data encryption after import of the new database is finished. For example, if the BACPAC file is exported from an on-premises SQL Server instance, the imported content of the new database isn't automatically encrypted. Likewise, if the BACPAC file is exported to an on-premises SQL Server instance, the new database also isn't automatically encrypted. The one exception is when you export to and from a SQL database. Transparent data encryption is enabled in the new database, but the BACPAC file itself still isn't encrypted. To configure transparent data encryption through the Azure portal, you must be connected as the Azure Owner, Contributor, or SQL Security Manager. You turn transparent data encryption on and off on the database level. To enable transparent data encryption on a database, go to the Azure portal and sign in with your Azure Administrator or Contributor account. Find the transparent data encryption settings under your user database. By default, service-managed transparent data encryption is used. A transparent data encryption certificate is automatically generated for the server that contains the database. 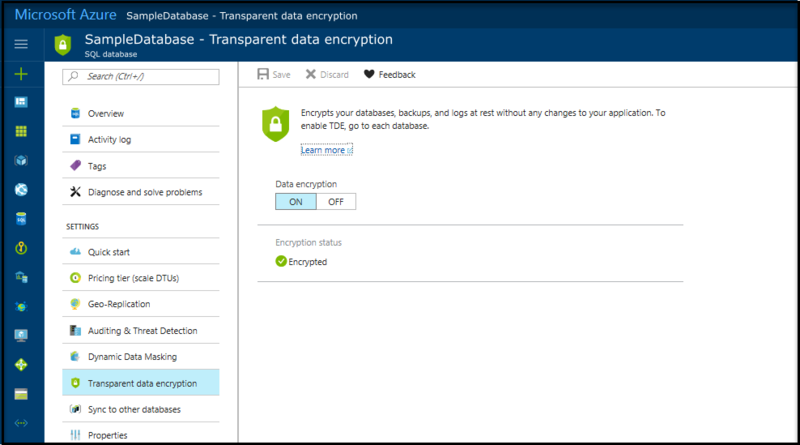 For Azure SQL Managed Instance use T-SQL to turn transparent data encryption on and off on a database. You set the transparent data encryption master key, also known as the transparent data encryption protector, on the server level. To use transparent data encryption with Bring Your Own Key support and protect your databases with a key from Key Vault, open the transparent data encryption settings under your server. To configure transparent data encryption through PowerShell, you must be connected as the Azure Owner, Contributor, or SQL Security Manager. For Azure SQL Managed Instance, use the T-SQL ALTER DATABASE command to turn transparent data encryption on and off on a database level, and check sample PowerShell script to manage transparent data encryption on an instance level. Connect to the database by using a login that is an administrator or member of the dbmanager role in the master database. You can't switch the transparent data encryption protector to a key from Key Vault by using Transact-SQL. Use PowerShell or the Azure portal. For a general description of transparent data encryption, see Transparent data encryption. To learn more about transparent data encryption with Bring Your Own Key support for Azure SQL Database, Azure SQL Managed Instance and Data Warehouse, see Transparent data encryption with Bring Your Own Key support. To start using transparent data encryption with Bring Your Own Key support, see the how-to guide Turn on transparent data encryption by using your own key from Key Vault by using PowerShell. For more information about Key Vault, see the Key Vault documentation page.